I was one of those moms who made baby food, I admit it. Not all the time, mind you, but once you realize that baby food is just regular food mashed up, it seems sort of silly to pay somebody else to do it. My daughter’s particular favorite was mushy peas. I would cook up a cup or so in some hot water until they were reasonably soft, whiz them up in a blender with a bit of the leftover water and a pinch of cumin, then pour them into an ice cube tray to create individual servings that I could pop out and warm up whenever I had a hungry girl to feed. I thought of this yesterday because a young woman from our neighborhood whom we had met on occasion over the years, died after a — terribly, blissfully — brief struggle with cancer. Her parents bravely kept friends and family informed of her illness through a blog, filled with memories, hopes, dreams, and wishes. I don’t know that I could do the same. A few days ago, one of her parents wrote of the joy of seeing their daughter eat five peas. 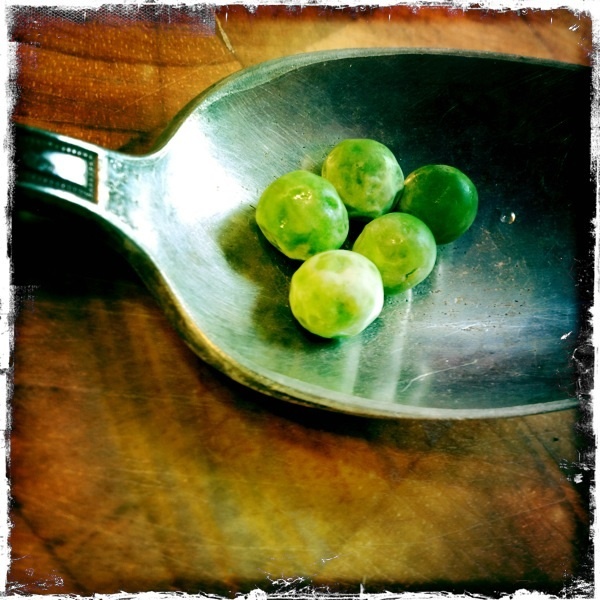 It brought a thrill of hope: perhaps the five peas might lead to a crust of bread, a bowl of soup, a miracle. When she was a baby, there would have been a different kind of joy in the same sight, the unspoken promise in watching this tiny creature take her first bites into solid food and the mysterious adventures ahead: an onion bagel with cream cheese, Pad Thai, a five-tiered wedding cake. Sometimes our dreams are unceremoniously taken from us without warning, and all we are left with are the memories — memories that we wouldn’t trade for anything, even as we curse the loss of the memories that we thought were yet to be made. Today I’ll savor the sweet taste of peas, and their assurance of springtime, and soft breezes, and the tug at my heart as I watch my own daughter grow to taste life on her own.